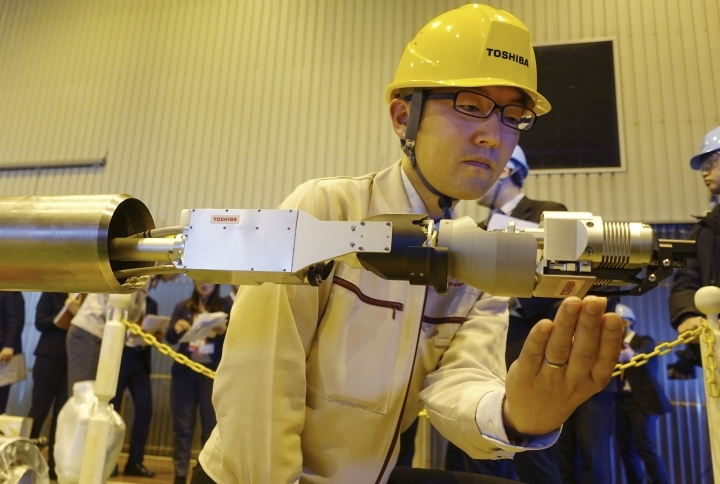 YOKOHAMA, Japan — Toshiba Corp. unveiled a remote-controlled robot with tongs on Monday that it hopes will be able to probe the inside of one of the three damaged reactors at Japan's tsunami-hit Fukushima nuclear plant and grip chunks of highly radioactive melted fuel. The device is designed to slide down an extendable 11-meter (36-foot) long pipe and touch melted fuel inside the Unit 2 reactor's primary containment vessel. The reactor was built by Toshiba and GE. 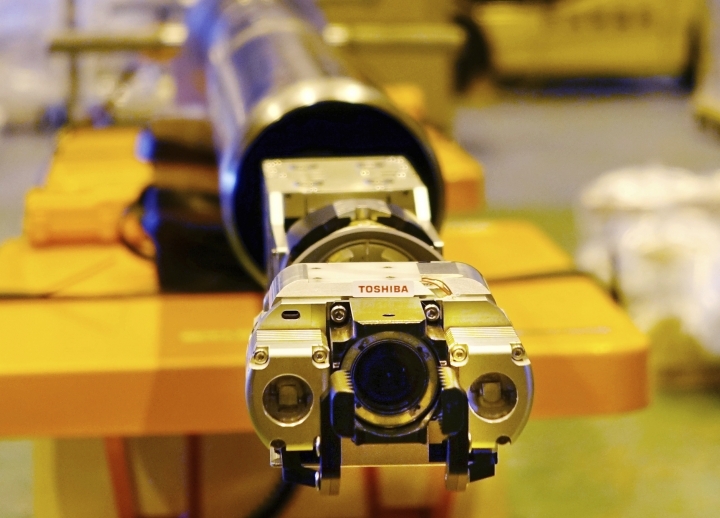 Toshiba's energy systems unit said experiments with the new probe planned in February are key to determining the proper equipment and technologies needed to remove the fuel debris, the most challenging part of the decommissioning process expected to take decades. In last year's probe, a camera developed by Toshiba Energy Systems & Solutions Corp. and the International Research Institute for Nuclear Decommissioning found large amounts of deposits in that area, including parts that resembled pebbles or gravel. The 30-centimeter (12-inch) long robot unveiled Monday will carry a radiation dosimeter, thermometer, LED lights, a camera and a pair of tongs as it slowly slides down from a pipe. The probe, attached by a cable on its back, is to dangle from the pipe and descend to the bottom of the reactor vessel's pedestal, a structure directly below the core from which the melted fuel fell. Toshiba plans to use the new device to touch and grip the deposits with the tongs, which can hold a lump as wide as 8 centimeters (3 inches) weighing up to two kilograms (4.4 pounds), to investigate its hardness and other details, said Jun Suzuki, a Toshiba ESS group manager for the project. "Until now we have only seen those deposits, and we need to know whether they will break off and can be picked up and taken out," Suzuki said. "Touching the deposits is important so we can make plans to sample the deposits, which is a next key step." The probe will mainly examine the fuel debris' physical condition rather than its radioactive components or other details which require actual sampling and safe storage. "We are taking one step at a time," said Tsutomu Takeuchi, a Toshiba ESS senior manager for the Fukushima decommissioning project. "First we'll find out if those deposits can be picked up." If the device is unable to lift anything, that's also a key finding, he said. In that case, they will need a cutting device to tear off a sample piece.